Students from the Chemistry Programme at Sci Tech Binyamina had their Programme Seminar Days at the Weizmann Institute in Rehovot. During the seminar, the programme’s tenth-graders met with a glassmaker who is producing special glassware for NASA, heard a lecture about fibers, and did lab work on the topic of the physical states of matter. 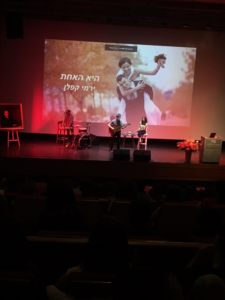 The school’s 11th-graders participated in a seminar encompassing chemistry majors from all the network’s schools across Israel. Titled “It’s All about Chemistry”, this seminar provided the students with lectures from the cutting edge of science, pharmaceutical chemistry, space exploration, radically low temperatures, as well as… love. 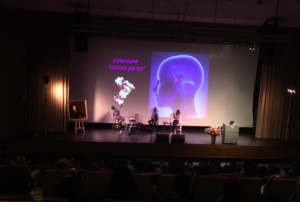 Students were exposed to scientists from various fields related to chemistry, heard about the importance of this subject from the president of the Weizmann Institute and from the Chief Inspector of Chemistry in the Ministry of Education, and enjoyed a lecture by Dr. Liat Yakir, one of the panel experts in the TV show “Wedding at First Sight”, on the topic of “The Chemistry and Music of Love”. 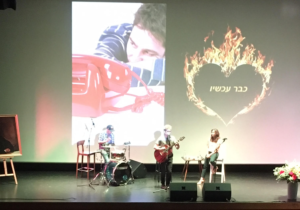 Finally, singer Yermi Kaplan entertained the students with some love songs.